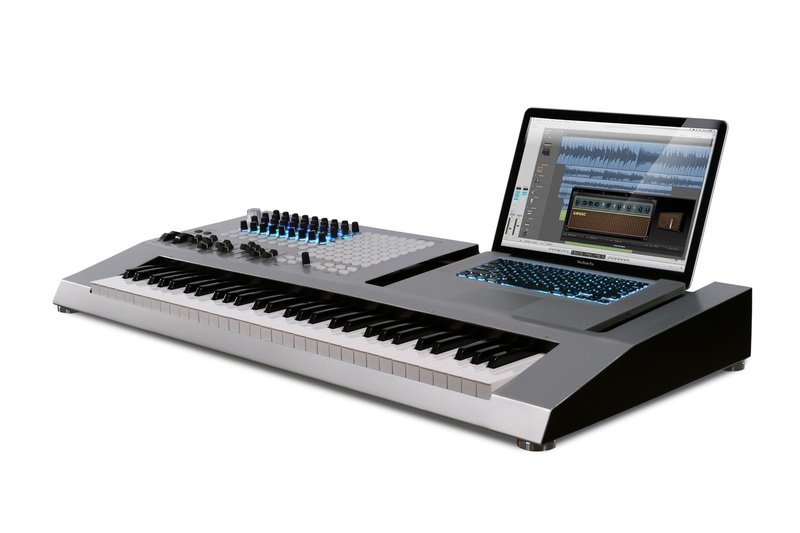 AUSTIN, Texas (SEND2PRESS NEWSWIRE) — Music Computing, Inc. today announced their brand new line of keyboard workstations for both gigging musicians and any size recording studio, are now shipping. The StudioBLADE™ and iKeyDOCK™ are complete, portable production stations, which either include a built-in Windows® 7 64-bit PC with touch-screen and DAW software and virtual software instruments, or a docking system for any PC/Mac notebook. 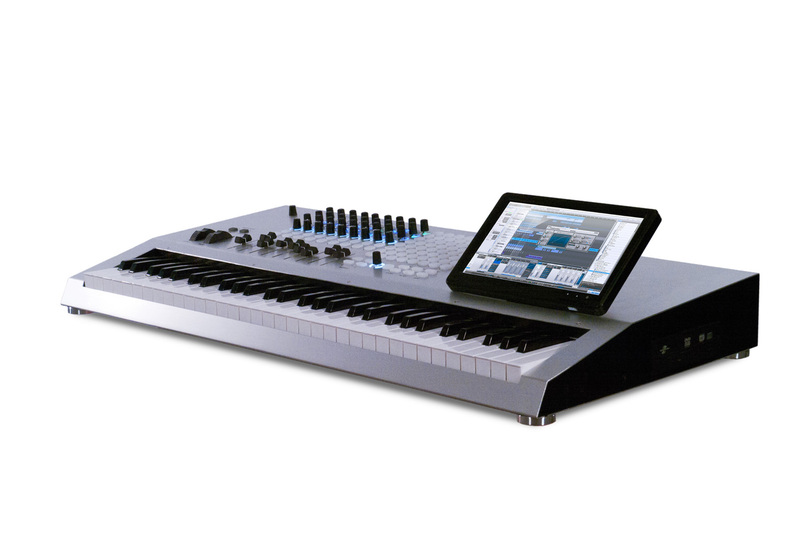 The StudioBLADE™ series are complete music production workstations powered by Intel® processors and 64-bit Windows 7, and each model ships with a total studio package with DAW (digital audio workstation), virtual instruments, mastering effects, and utilities to customize the exclusive ControlDAW™ MIDI control surface. Support for 2 additional monitors allows for total workspace customization. The large 64-button grid control surface, in addition to knobs and sliders, is a powerful tool for musicians using grid-style programs like Ableton Live, or classic drum pad boxes like the Akai® MPC. Music Computing’s TriggerGrid™ sample trigger player for drum pads turns the grid surface into a massive 64-pad virtual percussion instrument. Each StudioBLADE also includes Studio One Pro from Presonus, a highly respected DAW solution complete with virtual instruments and mastering FX, plus 10GB of sounds. Music Computing’s included SonicSource™ VSTi soft-synth contains thousands of sound presets providing a giant (8GB) starting point for both analog and digital textures. Pricing starts at $2599 (US/SRP) for the 61-key Intel Core2 base configuration with 24/48 audio, 2 combo XLR and 1/4-inch mic inputs with phantom power, 2 balanced outs, and headphone jack. Optional upgrades include 24/96 audio and 8 inputs, more RAM, and internal hard drives, to suit the user’s needs. Complete StudioBLADE information and images: www.musiccomputing.com/studioblade. The innovative and first-to-market iKeyDOCK™ keyboard workstations are OS platform neutral and suitable for any musician already comfortable with using a Windows® OS, and/or Apple Mac® notebook. The iKeyDOCK line handily bridges the gap between a system that can easily be transported to gigs, be used as a full-time docking station for any home or commercial studio, and any combination of these situations. Similar to the StudioBLADE series, minus the touch screen and internal PC, the iKeyDOCK provides a dockable solution for any notebook; simply plug-in and start playing. Like the StudioBLADE, a full-size 61-key synth-action style, or 88-key piano-style high-quality keyboard, audio and MIDI I/O, ControlDAW™ MIDI control surface, and performance software are all part of the package. For gigging musicians, finally cut the wires of having a MIDI keyboard, MIDI interface, external hard drives, and notebook as separate elements. With the iKeyDOCK, you simply place any notebook up to 17-inch screen size into the docking section and make connections for USB or FireWire and you immediately have a full workstation that looks good on stage, and fits on all standard keyboard stands. At just 24 lbs. the iKeyDOCK is a truly portable system. There is simply no other solution on the market that does what the iKeyDOCK from Music Computing can do – and it’s affordably priced, starting at $1499 (US/SRP) with 24/48 audio, 2 combo XLR and 1/4-inch mic inputs with phantom power, 2 balanced outs, and headphone jack. Optional upgrades include 24/96 audio and 8 inputs. Optional internal 2.5-inch hard drives expand storage for notebooks to replace the need for external drives. The iKeyDOCK may also be used with a desktop PC/Mac via 2xUSB or 1xUSB plus 1x FireWire, for maximum flexibility. Complete iKeyDOCK information and images: www.musiccomputing.com/ikeydock. A fully U.S. based company with local just-in-time (JIT) manufacturing capability, Music Computing designs, develops, and supports its products in-house. Products can typically ship within 7 days of an order being placed. Victor Wong, with more than 20 years of industry expertise, brings his computer music and electronics design and development prowess to Music Computing, Inc. His mission for the company is to invent new technologies and to integrate them with proven standards leading to the best possible instruments for musicians, educators, and studios. For more information, visit: www.MusicComputing.com. “Music Computing,” “StudioBLADE,” “iKeyDOCK,” “ControlDAW,” “GeoMIDI,” “SonicSource,” and “TriggerGrid” are trademarks of Music Computing, Inc. All other trademarks acknowledged. News issued by: Music Computing, Inc.
Alternate Headline: StudioBLADE and iKeyDOCK Music Workstations Now Shipping from Music Computing Inc.
News Source: Music Computing, Inc.
More from Music Computing, Inc.